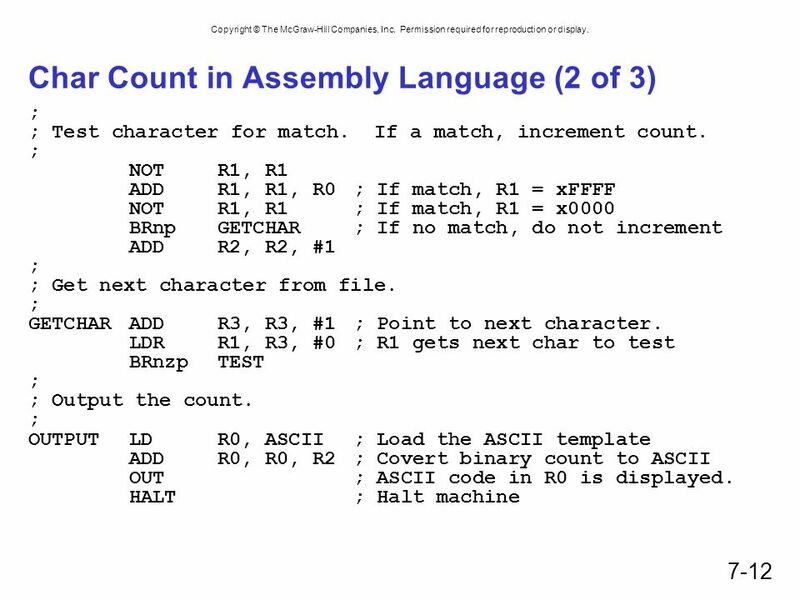 Chapter 7 Assembly Language. Copyright © The McGraw-Hill Companies, Inc. Permission required for reproduction or display. 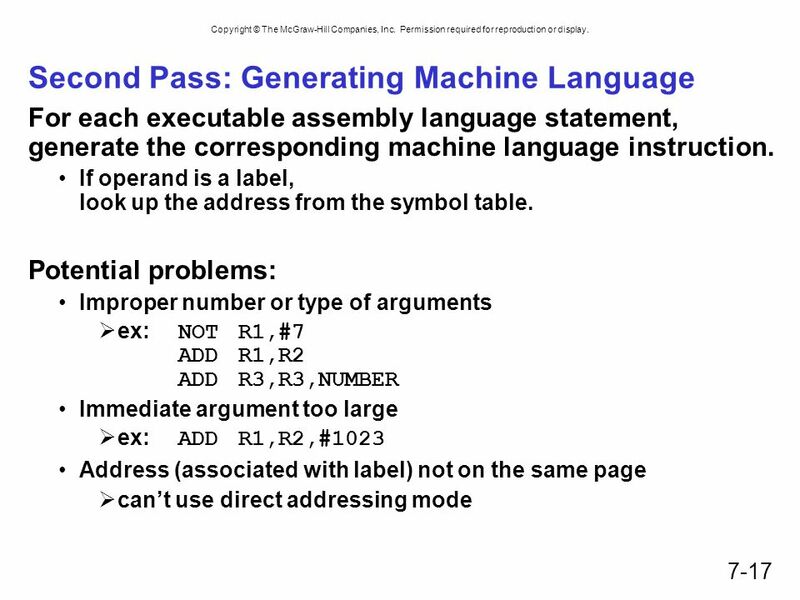 7-2 Human-Readable Machine Language. 8 Copyright © The McGraw-Hill Companies, Inc. Permission required for reproduction or display. 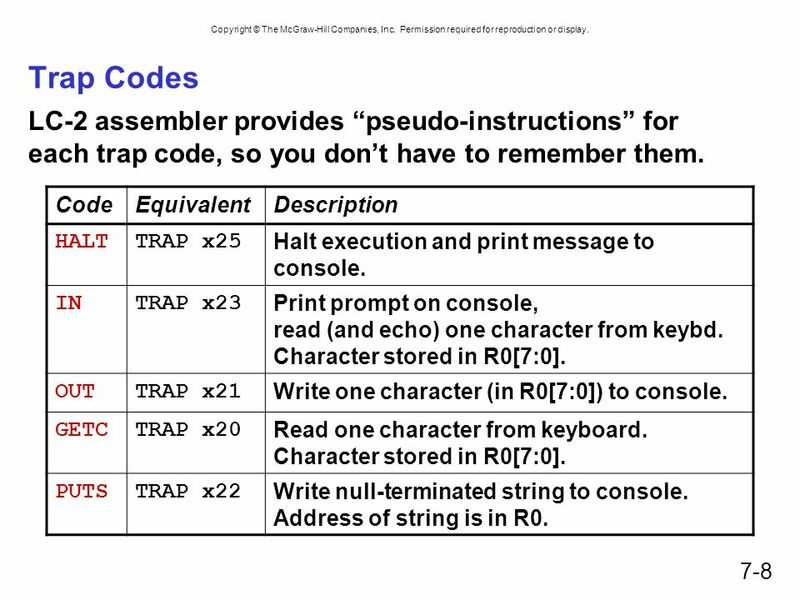 7-8 Trap Codes LC-2 assembler provides “pseudo-instructions” for each trap code, so you don’t have to remember them. CodeEquivalentDescription HALTTRAP x25 Halt execution and print message to console. INTRAP x23 Print prompt on console, read (and echo) one character from keybd. Character stored in R0[7:0]. 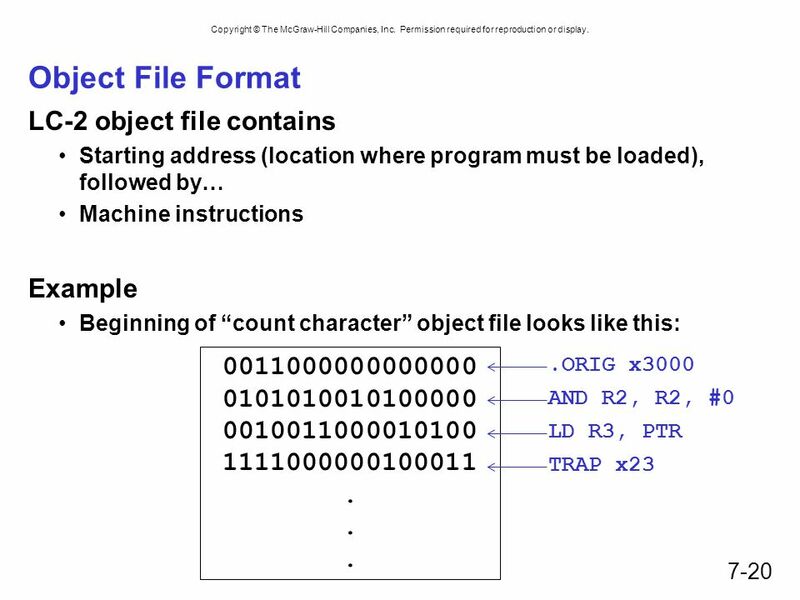 OUTTRAP x21 Write one character (in R0[7:0]) to console. GETCTRAP x20 Read one character from keyboard. Character stored in R0[7:0]. PUTSTRAP x22 Write null-terminated string to console. Address of string is in R0. 9 Copyright © The McGraw-Hill Companies, Inc. Permission required for reproduction or display. 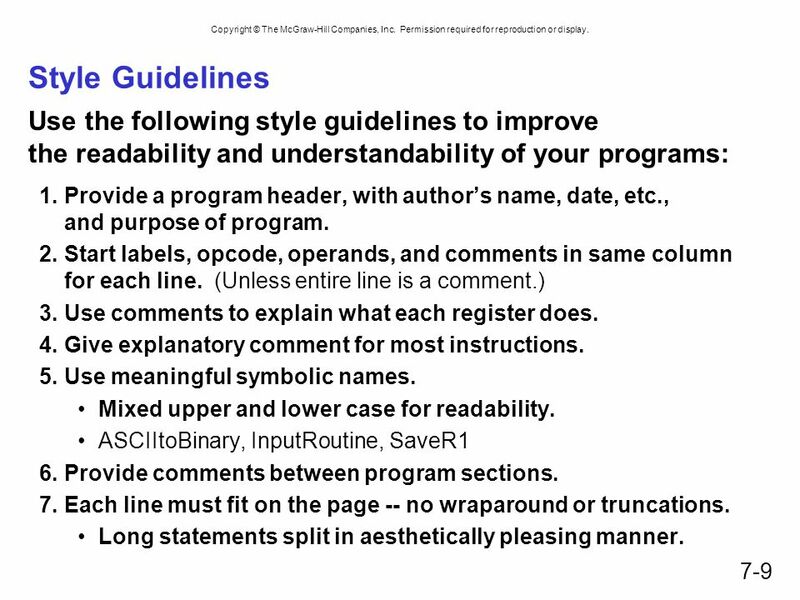 7-9 Style Guidelines Use the following style guidelines to improve the readability and understandability of your programs: 1.Provide a program header, with author’s name, date, etc., and purpose of program. 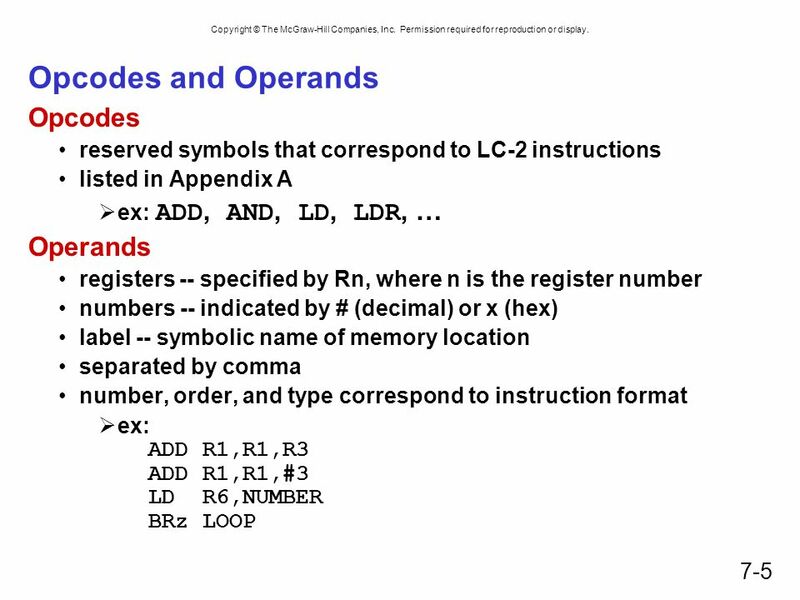 2.Start labels, opcode, operands, and comments in same column for each line. (Unless entire line is a comment.) 3.Use comments to explain what each register does. 4.Give explanatory comment for most instructions. 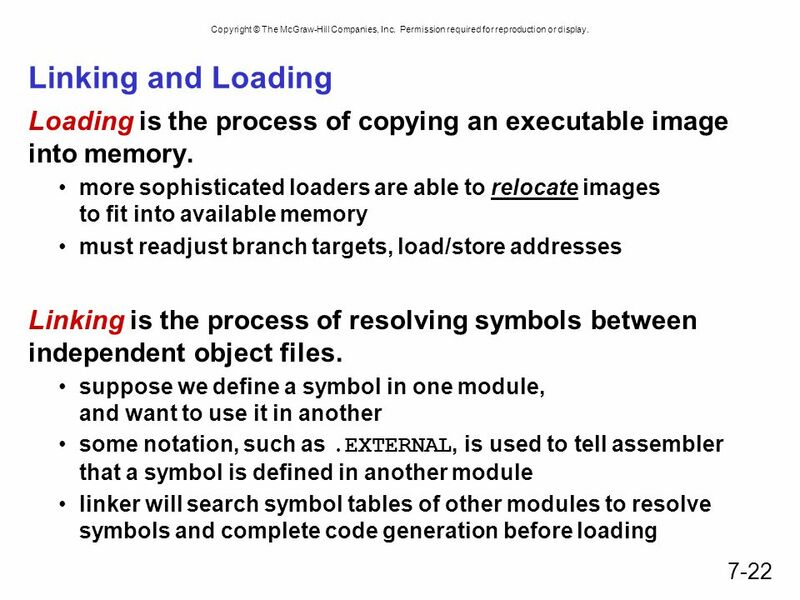 5.Use meaningful symbolic names. Mixed upper and lower case for readability. 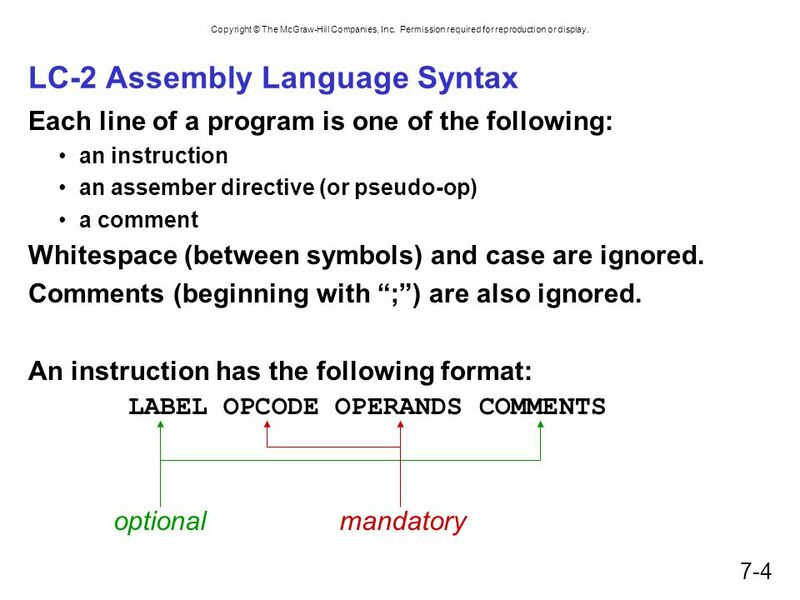 ASCIItoBinary, InputRoutine, SaveR1 6.Provide comments between program sections. 7.Each line must fit on the page -- no wraparound or truncations. Long statements split in aesthetically pleasing manner. 10 Copyright © The McGraw-Hill Companies, Inc. Permission required for reproduction or display. 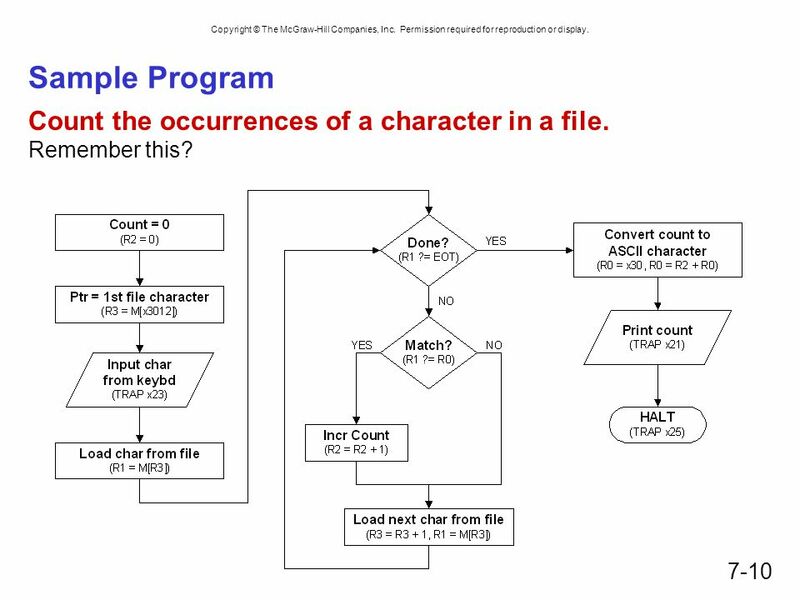 7-10 Sample Program Count the occurrences of a character in a file. Remember this? 15 Copyright © The McGraw-Hill Companies, Inc. Permission required for reproduction or display. 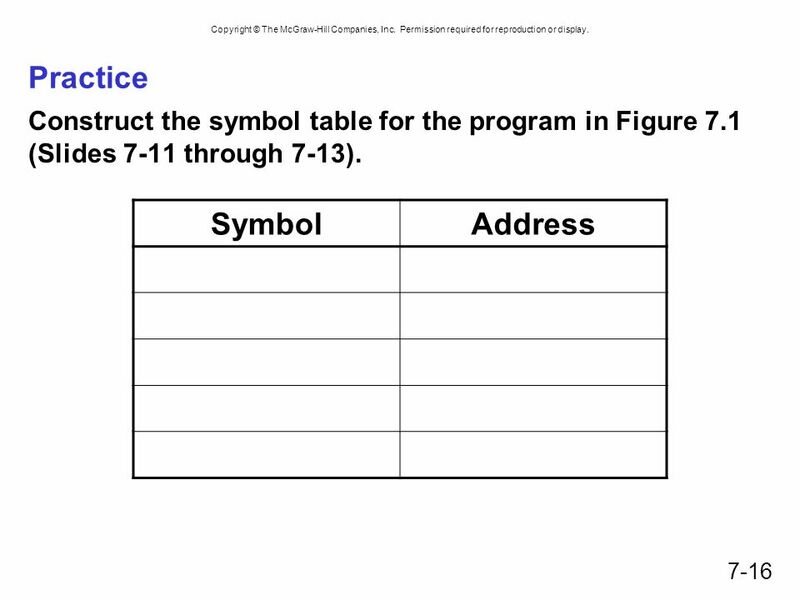 7-15 First Pass: Constructing the Symbol Table 1.Find the.ORIG statement, which tells us the address of the first instruction. 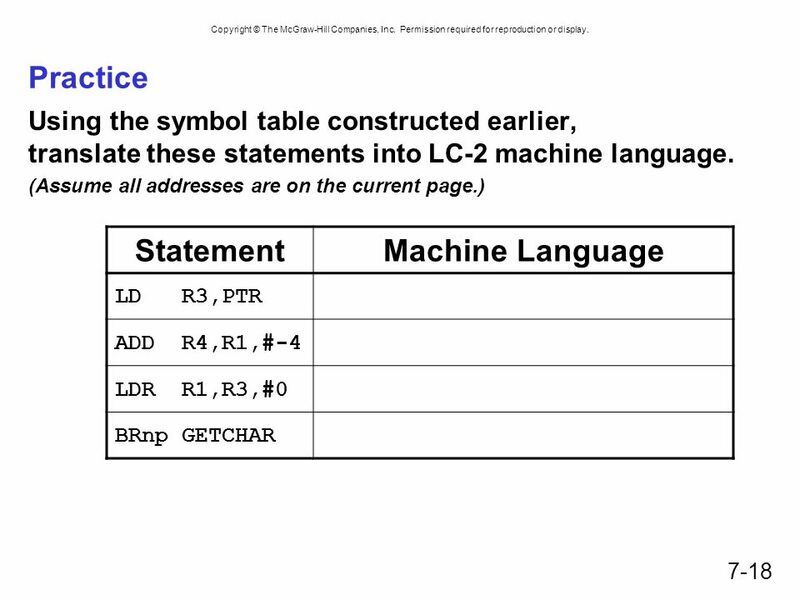 Initialize location counter (LC), which keeps track of the current instruction. 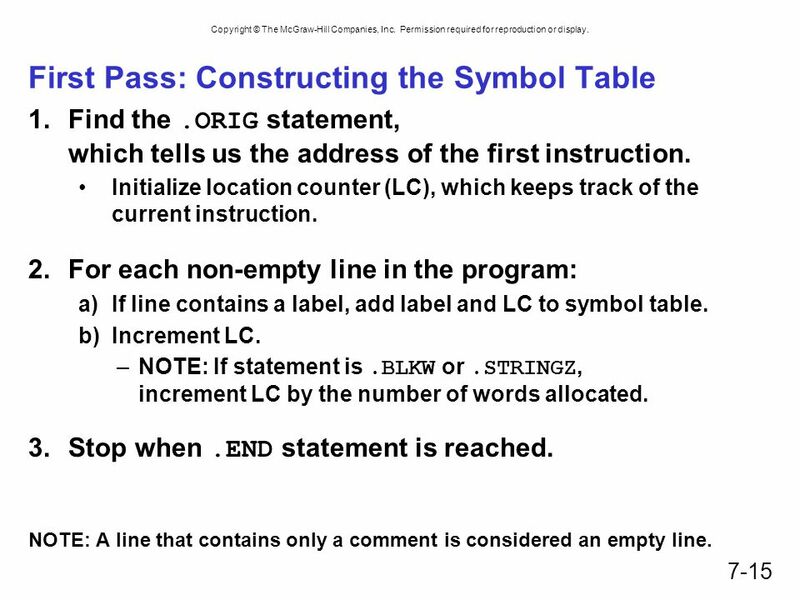 2.For each non-empty line in the program: a)If line contains a label, add label and LC to symbol table. b)Increment LC. 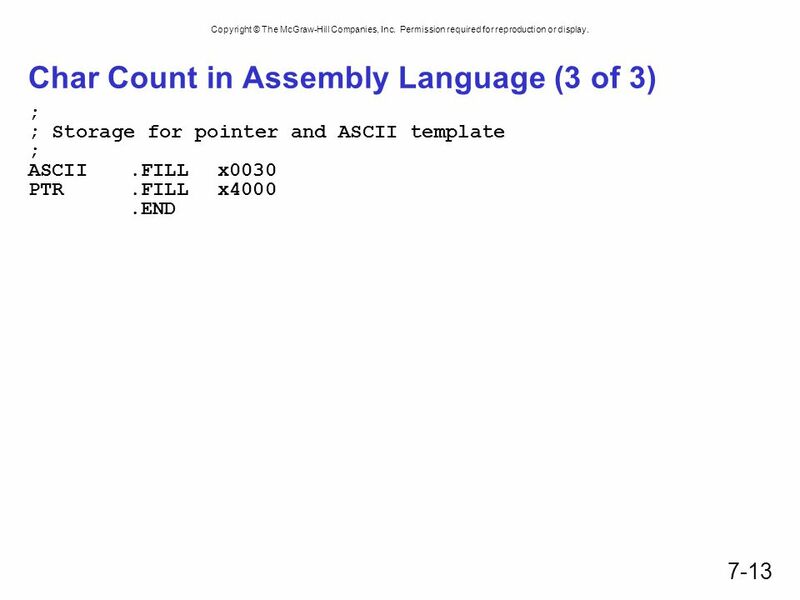 –NOTE: If statement is.BLKW or.STRINGZ, increment LC by the number of words allocated. 3.Stop when.END statement is reached. 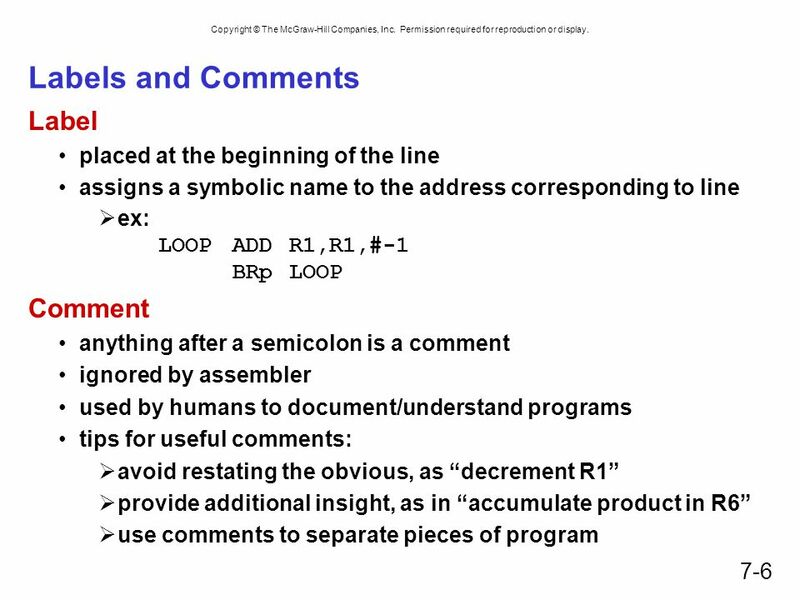 NOTE: A line that contains only a comment is considered an empty line. 19 Copyright © The McGraw-Hill Companies, Inc. Permission required for reproduction or display. 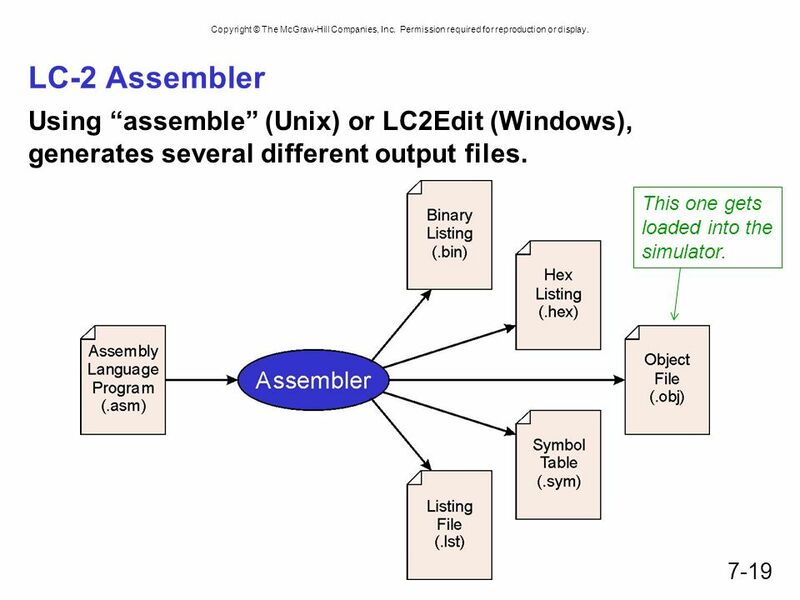 7-19 LC-2 Assembler Using “assemble” (Unix) or LC2Edit (Windows), generates several different output files. This one gets loaded into the simulator. 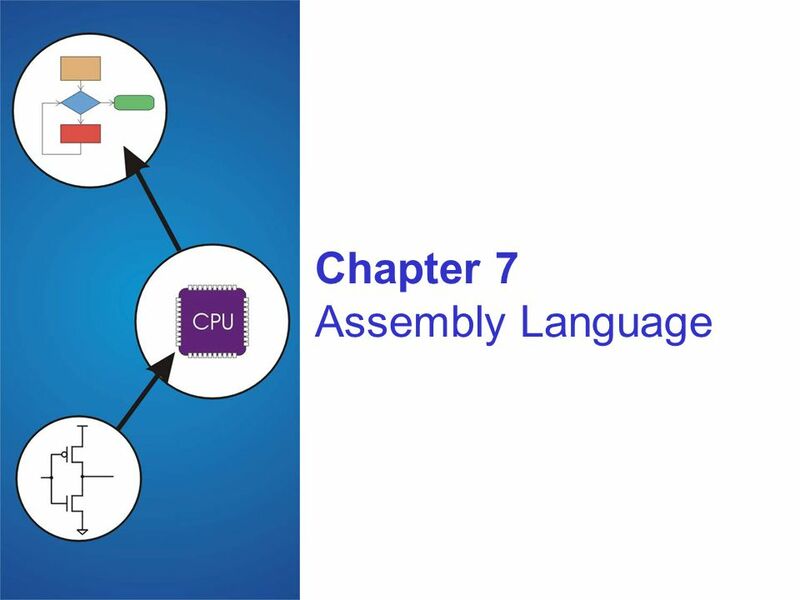 Download ppt "Chapter 7 Assembly Language. Copyright © The McGraw-Hill Companies, Inc. Permission required for reproduction or display. 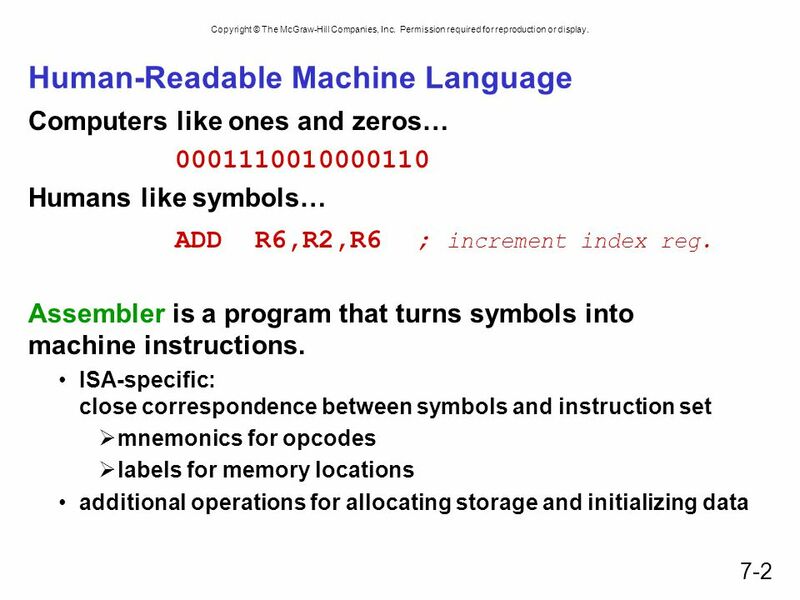 7-2 Human-Readable Machine Language." Computer Science 210 Computer Organization Strings, I/O, and Trap Service Routines. 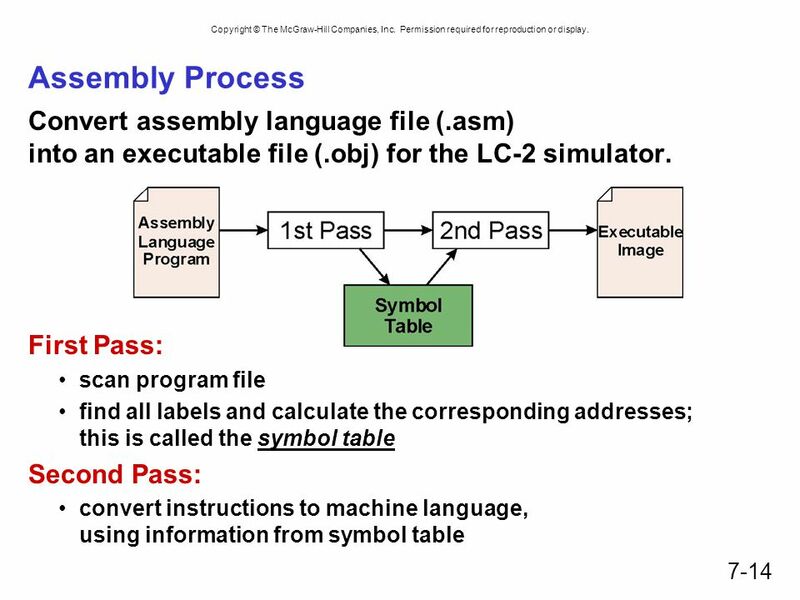 Chapter 7 Introduction to LC-3 Assembly Language Assembly Language Assembly Process Using the Editor & Simulator for Assembly Language Programming. Chapter 10 And, Finally.... Copyright © The McGraw-Hill Companies, Inc. Permission required for reproduction or display A Final Collection of ISA-related. 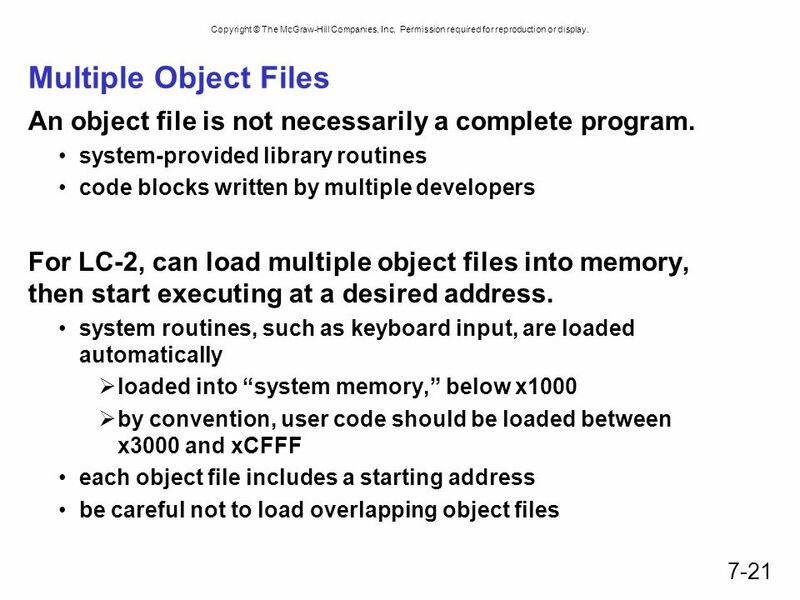 1 System Calls (TRAPS) and Subroutines Patt and Patel Ch. 9. 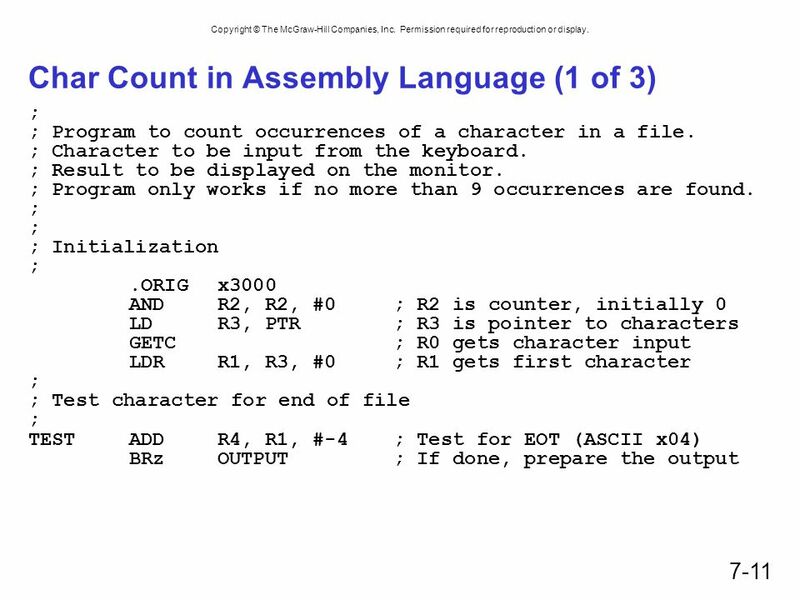 PART 6 Programming 1.Decomposition 2.Three Constructs 3.Counting Example 4.Debugging. Chapter 9 TRAP Routines and Subroutines. Copyright © The McGraw-Hill Companies, Inc. Permission required for reproduction or display. 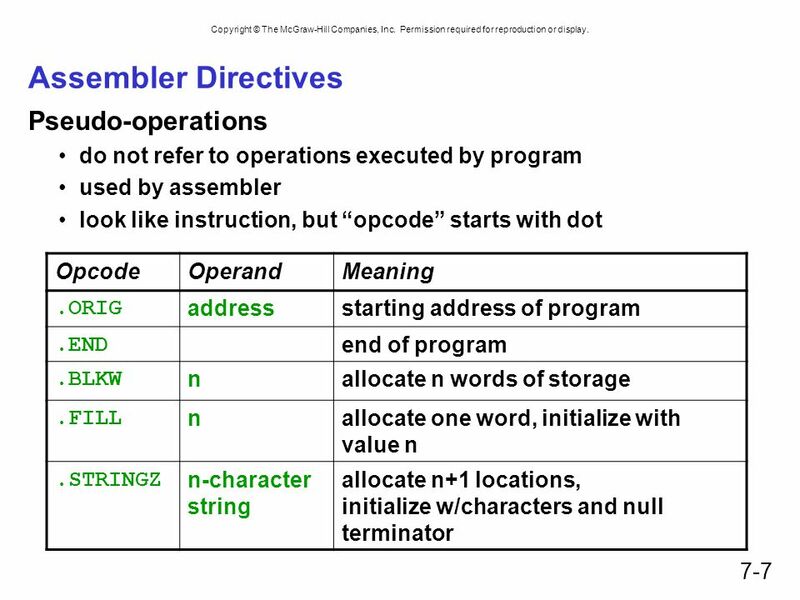 9-2 Subroutines. 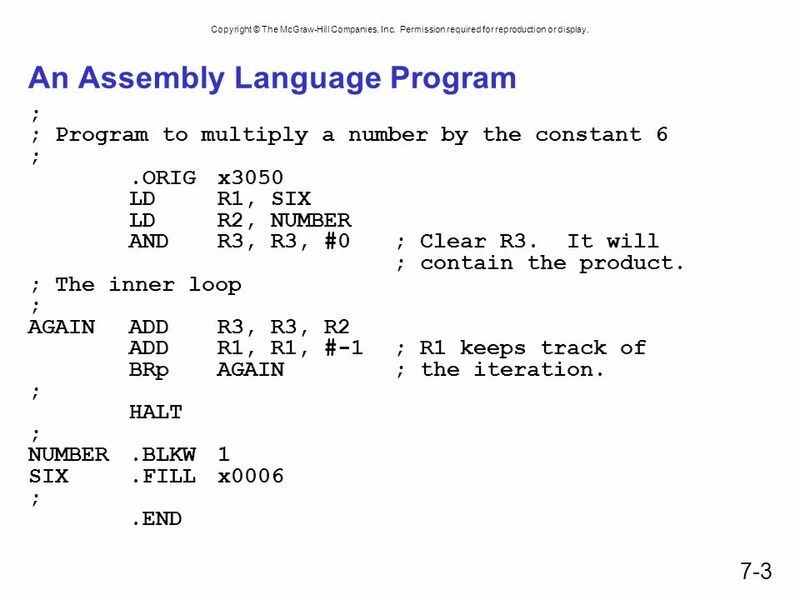 Introduction to Computing Systems from bits & gates to C & beyond Chapter 7 LC-2 Assembly Language. Introduction to Computer Engineering ECE/CS 252, Fall 2010 Prof. Mikko Lipasti Department of Electrical and Computer Engineering University of Wisconsin. Chapter 10 And, Finally.... Copyright © The McGraw-Hill Companies, Inc. Permission required for reproduction or display. 10-2 A Final Collection of ISA-related.